In 2008, Sahjdar Bibi was killed by her cousin for refusing to follow the tradition of cousin marriage and choosing her own husband. On June 18, two days before the decision of the court, her father, Saad Ullah, her uncle Ahmed Khan and others tried to kidnap her from the court premises, but failed. The order was granted and they were legally barred from harassing her further. Sajida Bibi’s first cousin an influential army officer, Major Zia Ullah Khan of Rawalpindi Garrison. Shortly after this case Sargodha police officers started threatening the couple. The bride again filed a case for protection before the Lahore high court on July 27, 2008 and on August 6 the court of Justice Saifur Rehman passed an order restraining Sargodha officers from harassing the pair. Ahmed Khan, the bride’s uncle, then lodged a First Information Report (FIR: an official document for further legal proceedings) against the groom, the groom’s father Mohammad Aslam and his younger brother on August 13 in Cantt police station, Sargodha, claiming that they kidnapped Sajida Bibi. Khan also claimed that his daughter was already married and that she should therefore be punished under Hudood laws. Arshad was arrested but his wife recorded a statement in his defence. 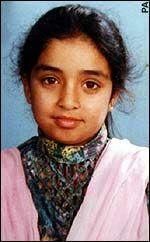 On October 23 before Mr. Jamshed Mubarak Bhatti, civil judge of Lahore in a family court, Sajida then filed a case of defamation against her uncle and against a Fateh Khan, a Sub-Inspector who was allegedly claiming to be her husband, and whose brother (Inspector Nasr Ullah of the Lahore police) was also harassing her. Two days later the father and brother of her husband (Aslam, son of Mohammad Liaquat Ali, and brother, Tahir, 22) were reportedly abducted by Saijida Bibi’s father, uncle, cousin (Major Zia Ullah) and Inspector Nasr Ullah. According to witnesses they were taken from the Solang Wala Dera bus stop at around 8pm on October 25 in two cars, one of which was black with the registration number MI 1432, from Shekhupura. Sajida Bibi went into hiding after her husband’s arrest, but on October 27 Sajida Bibi, along with the two badly beaten abducted men, was taken from her place of hiding by her uncle and father and went missing. On October 28 the groom’s mother, Mrs. Zetoon Bibi lodged FIR 1112/08 for the abduction of her husband, her son and her daughter-in-law in Cantt police Station. Since the kidnappers have powerful connections among the police and military and despite that she has written more than a dozen letters to authorities, she never received a reply and all three were killed.